you also should love one another. to celebrate their risen friend. to share his bread, his loving cup. he by his cross shall lift us up. for service, too, is sacrament. sent out to serve, as he was sent. and my sheep know me. about what you will eat or what you will drink. and began to wash the disciples’ feet. And Pilate handed him over to be crucified. I abide in the Father, and the Father abides in me. He took bread, and after giving thanks, he broke it. In the same way, after supper, he took the cup. and she broke open the jar and poured it on his head. Christ laid aside his crown for my soul! It is good to thank God. We thank you, God, for renewing us at your table by the presence of our Christ. Thank you for your eternal love, the Bread of Life that sustains all creation. May you continue to love us in our faithful acts and by that love discourage us from our unfaithful acts, that we might rejoice to be your servants in the world. Amen. We are like Peter, who didn’t always understand you, and we are like Judas, who betrayed you. 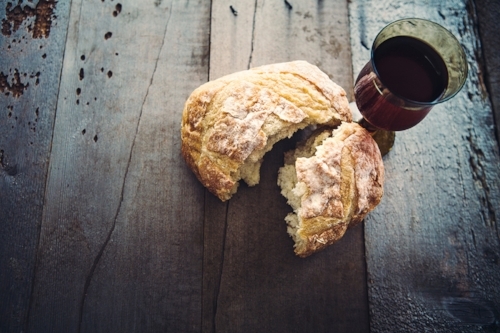 You offer us the bread of life and the cup of salvation. You ask us to love like you love. But we are not nearly enough like you. Far too often, we know not what we are doing. Even still, you have stayed with us every step of our journey. Give us strength, at least, to stay with you on yours. As if you could stop this blessing from washing over you. As if you could turn it back from the bowl to the pitcher, from the pitcher to the hand that set this blessing on its way. As if you could change the course by which this blessing flows. As if you could control how it pours over you unbidden, unsought, unmasked, yet startling in the way it matches the need you did not know you had. As if you could become undrenched. As if you could resist gathering it up in your two hands and following the arc which this blessing makes. Jesus said, “One who has bathed does not need to wash, except for the feet, but is entirely clean. And you are clean, though not all of you.” Do you know what I have done to you? You call me Teacher and Lord—and you are right, for that is what I am. So if I, your Lord and Teacher, have washed your feet, you also ought to wash one another’s feet. For I have set you an example, that you also should do as I have done to you. Christ’s dinner table seminar with wine and bread for their meals for a moment it strays from the Psalms they are studying together and it gets terribly personal. Ideas in the head are realized as facts in the heart. Teutonic questions percuss the drumhead table Is it I? Is it I? Is it I? Will I be among the lucky eleven? Or will I be the luckless one? Will doubt tonight mature into my denial? Will grief break out tonight and make its grab? Kyrie Eleison. Kyrie Eleison. Kyrie Eleison. So while reclining next to Jesus, Simon Peter asked him, “Lord, who is it?” Jesus answered, “It is the one to whom I give this piece of bread when I have dipped it in the dish.” So when he had dipped the piece of bread, he gave it to Judas son of Simon Iscariot. After he received the piece of bread, Jesus said to him, “Do quickly what you are going to do.” Now no one at the table knew why he said this to him. Some thought that, because Judas had the common purse, Jesus was telling him, “Buy what we need for the festival”; or, that he should give something to the poor. So, after receiving the piece of bread, he immediately went out. And it was night. Unclench your fist. Hold out your hand. Take mine. Let us hold each other. This is God’s glory manifest.